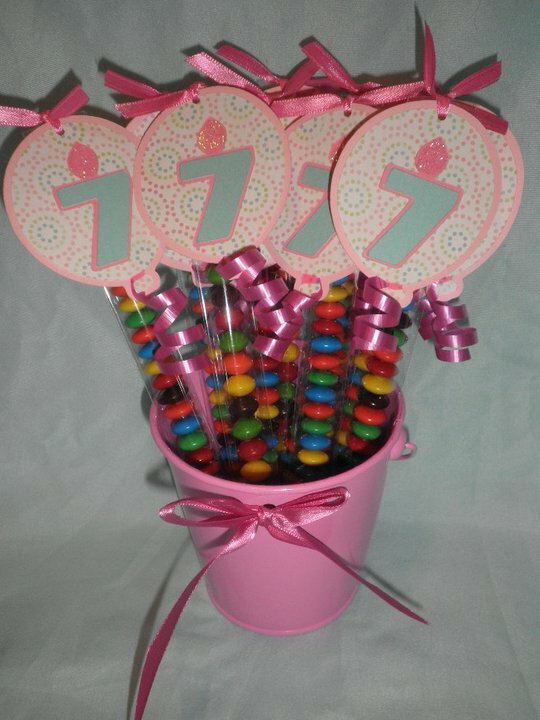 Here are some custom birthday favors that I was asked to make for a 7 year old girl's birthday party. The cupcake is cut from Sweet Treats. 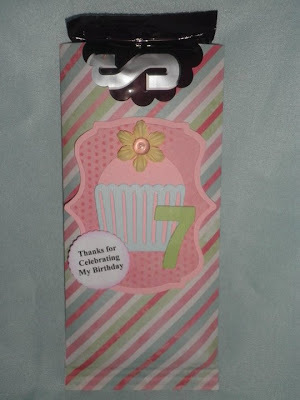 The background shape is cut from Storybook and the 7 is cut from Don Juan font. I printed the writing on my computer and punched it out with a martha stewart scallop circle punch. Skittle / M&M sticks! These have been my fav to make lately! The balloons are cut from Celebrations and the 7 candle is cut from Sweet Treats. I used real curling ribbon for the ribbon hanging from the balloons. OK now EVERYONE has been asking me where I get these bags. Here is the link :) Enjoy!! Thanks for visiting my blog today. I'm trying to blog atleast 4 times a week now! I've been slacking lately :) I do post daily on my facebook page though so if your on facebook come on over and become a fan! !